Help ACT Fund a Chair! - Attleboro Community Theatre, Inc.Attleboro Community Theatre, Inc. Help ACT Fund a Chair! 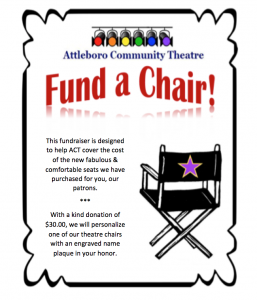 - Attleboro Community Theatre, Inc.
Home » Uncategorized » Help ACT Fund a Chair! Attleboro Community Theatre is a non-profit 501c3 organization. ACT relies heavily on donations, ticket sales, and grants to continue to present different productions throughout the year. With the rising costs of rights, building materials, and production equipment, we are hoping to reduce the cost of the purchase of our new chairs. With most shows ranging from 1.5-2 hours we want to make sure that our sponsors, community, and patrons all feel comfortable while seeing some of our great shows. Each chair is $30 and our theatre holds 100 patrons. We hope you will help support ACT buy sponsoring a chair. Any donation to help reach our goal is much appreciated. For any patron spending at least $30 we will be placing name plates on the back of the chair for your recognition to the cause. ACT is an award winning theatre receiving 6 Motif awards for the past season. We hope to continue to provide the community with an enjoyable theatre experience.